Sam Adams Seasonal Brew – medium size; 9 1/2 inch, 3-sided, heavy composition. Quality made tap with the rustic pub look. Inserts can be changed to use 4 different brews. They are pictured in the photo. They are easily interchangeable. Used, excellent condition. A few scratches on the top dome. 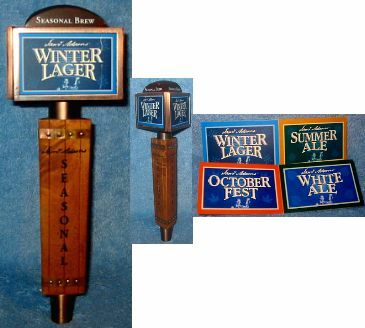 There is a scratch on the right side of the one Winter Lager insert (The one pictured on the tap).